A major shift in approaching Schizophrenia has been witnessed among psychiatrists with the belief now that early diagnosis and intervention may have a positive influence on the outcome of schizophrenia. The search for key diagnostic clusters to enhance early diagnosis is underway as well as concerted efforts to find biomarkers of disease and disease progression. 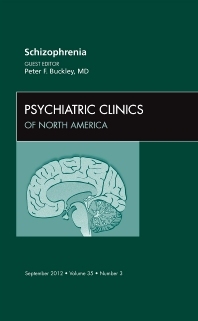 To address this, this issue of the Psychiatric Clinics of North America presents distinguished academic clinicians and neuroscientists who provide comprehensive overviews of the present state of knowledge on the epidemiology, early clinical characteristics, and diagnostic changes, proposed pathogenesis, neurobiology, and treatment requirements for this disorder. The current state of knowledge is substantial, academically credible, and scientifically based. Topics on the subject of early intervention in and diagnosis of schizophrenia include: Nosology of Schizophrenia: Defining Illness Boundaries Based upon Symptoms; Neurodevelopmental Hypothesis of Schizophrenia; Predicting Risk and the Emergence of Schizophrenia; Is Early Intervention for Psychosis Feasible and Effective? ; Can Neuroimaging Be Used to Define Phenotypes and Course of Schizophrenia? ; Reliable Biomarkers and Predictors of Schizophrenia and Its Treatment; From Study to Practice: Enhancing Clinical Trials Methods Toward ‘Real World’ Outcomes; Relapse Prevention in Schizophrenia; Antipsychotic Polypharmacy; Cognitive Remediation: Retraining the Brain in Schizophrenia; Peers and Peer-led Interventions; Homelessness; and The Emerging Role of Technology and Social Media in Caring for People with Schizophrenia. Each presentation in this publication includes an Overview, Implications for Practice, with Summarizations of Important Clinical and Learning Points.